The Aurora Borealis dances in the sky during a solar storm in early October. Though I have spent a lot of time in the far north, I had never had the chance to see the colorful lights that illuminate the poles of the planet when the sun dips far enough below the horizon to create a dark sky. The flickering and dancing curtains of the aurora are a humbling sight because without them, life as we know it would not be possible. The earth's inner core and unusual atmosphere block the sun's powerful radioactive storms, allowing life as we know it to flourish oblivious to the ferocity of outer space. A boulder sized chunk of glacial ice sits atop a black sand beach, trapped by the shifting tides as nearby icebergs drift out to sea in the distance. I have always found icebergs to be a tragically beautiful sight as they mark the final life-cycle of glacial ice. Like snowflakes, each sculpture of ice has its own fleeting form while they drift away, rumbling and booming as they collide and collapse in the crashing waves. A glacial river snakes through Skeiðarársandur (a massive glacial outwash plain) as a dusting of snow is illuminated by the first soft golden light of sunrise. As the nearly 10 mile-wide Skeiðarárjökull glacier (top left) recedes back into the mountains, the sediments from the peaks that once stood in the glacier's path formed the largest sandur (glacial outwash plain) on earth, covering nearly 1300 square kilometers. This is no coincidence. The combination of active volcanic activity beneath the glacier's surface and a warming climate make the glacier susceptible rapid melting and flooding that washes through the barren landscape. Scenes like this make it easy to feel helpless to the massive scale nature's power, yet the decisions people make today influence the planet on a geologic scale. Two house-size icebergs float towards the sea in a glacial lagoon formed by the glacier Breiðamerkurjökull. Thanks to Vatnajökulsþjóðgarður National Park, who allowed me special photographic permissions, I was able to capture images of the ice from an aerial perspective. Day after day, icebergs like these break from the deceptively permanent wall of ice at the edge of the Breiðamerkurjökull, drifting into the now massive glacial-melt formed lagoon that only began to appear in the mid-20th century. A braided stream pours from the glacier Eyjafjallajökull (pronounced eh-yaf-yatla-yo-kutl) that sits atop the volcano that famously erupted in 2010 and stoped air-travel over the Atlantic and mainland Europe. The unique combination of abundant volcanoes and glaciers in Iceland makes it a dramatic and rapidly changing landscape unlike any other on earth. As the glaciers in Iceland disappear this strange dynamic is becoming even more complex. Lómagnúpur mountain rises nearly 3,000 feet straight up, towering above the golden grassland plains on the western edge of Skeiðarársandur. The ancient sea-cliffs are so striking against their flat surroundings, that they have been an important part of Icelandic folk-tales since the early days of the island's first human settlers. A crack spans through the textured vertical layers of glacial ice on a large iceberg. Glacial ice forms uniquely from other types of ice because it originates as snowfall, not just regular frozen water. In cold climates and high altitudes, the snow from the winter can remain throughout the warmer summer months, piling up and compressing layer-after-layer for hundreds or even thousands of years. The intense compression beneath the weight of the layers above forces all of the air out of the snow, creating the dense blue ice that is so unique to glaciers. As the climate in glaciated regions becomes milder in summer months, the melt of snow and ice is outpacing most winter formation, causing glaciers to deflate and retreat. A small piece of ice glistens like a diamond between the golden afternoon skies and a silt-filled glacial lake. I have been fascinated by glacial ice ever since I saw it for the first time 4 years ago. Every piece of ice is different from the next, each telling a fleeting story of the past and present of the planet. 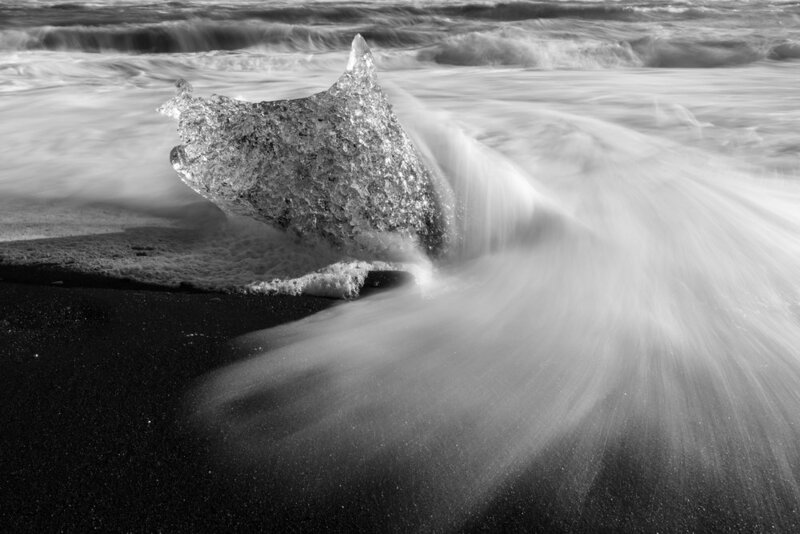 A fast wave reaches like a hand around a sparking diamond of ice, reclaiming it to the ocean as the tide slowly rises higher. The cycle of this ice from ocean-water to snow and back to the ocean as glacial ice takes as long as 1000 years. It is amazing to think that the snowstorms that created this piece of ice may have fallen as the vikings were creating the first human settlement on the island many centuries ago. Ice is nature’s time capsule. I sometimes wonder how different the world will be when ice that forms today (if it is able to do so) emerges from the glacier and what stories that ice will reveal to future generations about today. A turquoise-colored stream glows in the afternoon light as a coming storm approaches the barren coastline of southern Iceland. A swirling river of light and dark created by the Aurora Borealis dances atop a pyramid shaped mountain in the South of Iceland during a solar storm. Vibrant and dancing auroras occur when either a sun spot, flare, or coronal hole on the sun create a cosmic stream of energized particles known as the solar wind, that blows at nearly one million miles per hour towards our remarkably resilient planet. During such a storm, these energized particles are deflected by earth's magnetic field and are funneled near the poles where their energy is emitted as the brilliant Northern Lights. When it comes to nature photography, sometimes the most spectacular scenes come when you least expect. At sunset I discovered this strikingly clear iceberg being battered by the waves as the tide slowly gradually came up. Though I was set up for the sunset, I decided to wait a few more minutes to see how the light would change. The sunlight slowly disappeared behind the horizon and the icebergs appeared to glow under the soft cast of ambient light. As wave after wave crashed and tumbled the coast, each iceberg took on its own unique hue of blue and green, indicating part of their history in the glacier during their final moments as glacial ice. Waves from the raging seas of the North Atlantic wash over a jagged volcanic rock formation, carved away from the nearby coast by water, wind, and time. Seeing these eroded rock formations being tumbled by the ocean, I couldn't help but see the opposing similarities between the blue-white icebergs from yesterday's post and the dark black volcanic formations in this image. Iceland is a place of opposing forces as the ice and volcanic fire clash to build and carve the unique island in the North Atlantic. Soft northern sunlight highlights the ridges and curves along the mossy walls of the Fjaðrárgljúfur canyon in the south of Iceland. The canyon was formed at the end of the last ice age when a powerful meltwater river dug 100 meters through the layers of sediment and rock. Though only a small stream flows through the canyon today, landscape features like these hint to the staggering power of melting glaciers.